Not only are we computer repair specialists, First Connect Computers also supplies Quality Computer Systems. 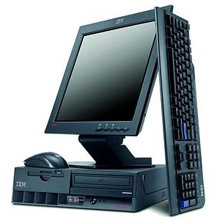 For example, if you own a small business and need to install or replace without breaking the budget, we stock IBM Workstations, with or without the screens. As stocks are continually changing, it is best to call in or request a quotation. We Custom Build PC's and have systems ready-to-go.